'Versailles Tetra Mix' is the cultivar of choice for commercial cut flower production and remains among the best selections for use as a cut flower for home gardeners. Held on strong tall stems, the large flowers will be in bloom from summer right through to first frosts at the end of autumn and provide plenty of colour in the garden and for vases full of cut flowers. An excellent variety, Cosmos 'Versailles Tetra' are very easy to establish from seed and a superb choice for garden beds, cut flower gardens or naturalised areas. They are disease free and tolerant of poor soil, heat and humidity and thrive in just about any climate and soil conditions. It is an excellent choice if you are looking for an easy to grow, no fuss annual that will thrive on minimal care and is a good choice for children or the less experienced gardener. Water, sun and soil are all that is needed. The flowers arise by the hundreds all summer on vigorous plants and are one of the best nectar plants for attracting bees and butterflies to the garden. The large ruffled blossoms will make a dramatic statement in your bouquets and flowering borders. Like many of our warm weather annuals such as marigolds, Cosmos originated in Mexico and South America. 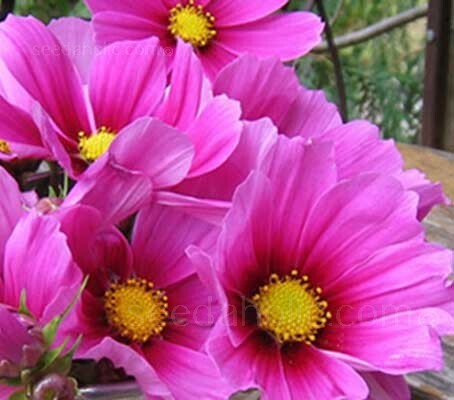 Spanish priests grew cosmos in their mission gardens in Mexico. The evenly placed petals led them to christen the flower "Cosmos," derived from the Greek kosmos, the word for harmony or ordered, or balanced universe. From this we also get the common name of "The Mexican Aster". The species name is from the Latin bipinnatus meaning “twice-pinnate” The botanical epithet is from the Latin pinnatus meaning “with leaflets arranged in opposite pairs.